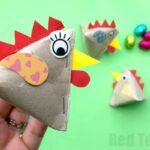 Welcome back to this week’s Kids Crafty (a couple of days early)! If you know our house, you will know that we have pots of pencils and pens and crayons and scissors and all sorts floating around all the time. Tidy it is not. And if we need to clear a surface we need move LOTS of things. So we decided it was about time of a desk tidy! 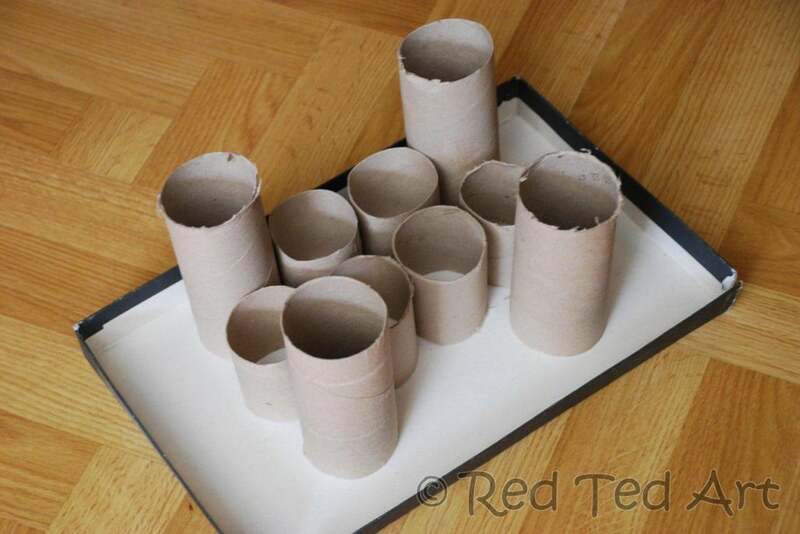 And not any desk tidy – but a toilet roll desk tidy (why of course! Our favourite craft material)!!! A perfect Back to School craft too. Get your kid’s tables sorted. We started off relatively simple and then got a bit carried away – the little boat is for some Peanut People we made, but you could also use it hold erasers and pencil sharpeners. The trees are there, so that you can add sheets or paper/ letters of postcards between the castle and the trees. Perfect. 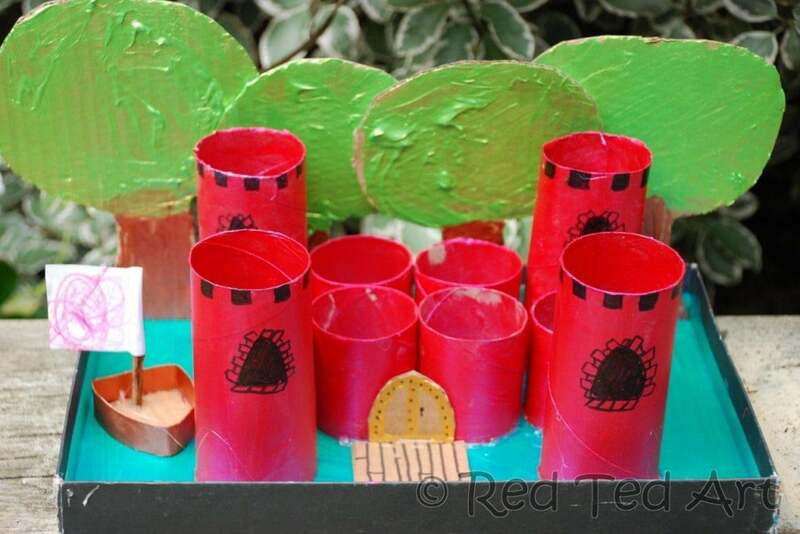 Materials: 7 Toilet rolls (3 cut in half), acrylic paint, extra bits of card for trees, boat and door, paint, a shoe box lid (a piece of card would be ok too, but the lid has the added bonus of having a rim, which means things will not roll out of it). 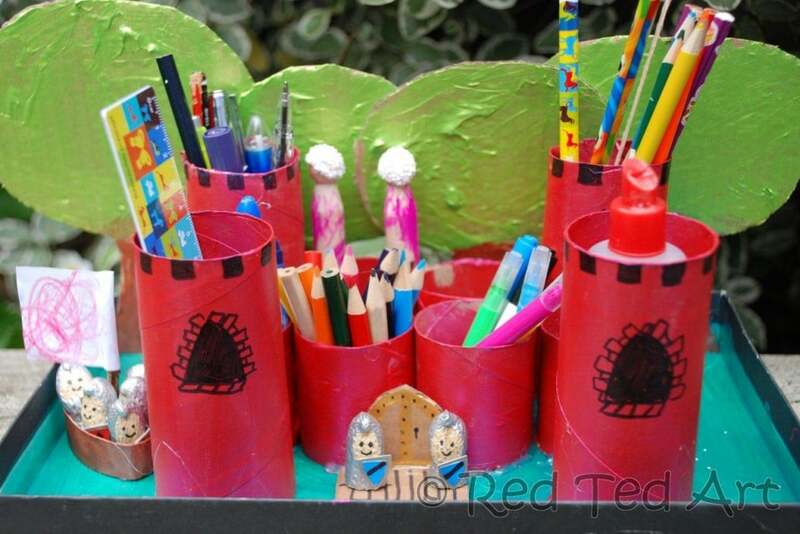 We intended to paint the castle red. But I had run out of red. So this shiny pinky/red it was! 1) Cut your loo rolls to shape. And decide on the basic lay out for your castle. 2) Paint your loo rolls. Wear old clothes, acrylics do stain. 3) Cut out any extras such as trees and paint. Again, I cut, the kids painted..
5) Glue in place. 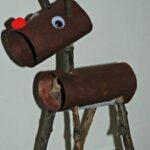 Now we used a hot glue gun, as I have many a child hood memory of things like this falling apart and being VERY annoying. 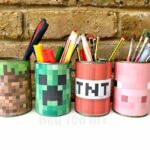 So either use VERY GOOD PVA glue, supported by a bit of masking tape (that you can paint over) or a hot glue gun! The trees are glued to the rim of the shoe-box lid. 6) I then cut out little extras like the boat and the draw bridge and we stuck it all in place. And here full of pens! You’re castle is so cool, and the knights look cute – I can’t wait for your book! I’ve linked up and thanks for the heads up on the competition, I’m off to enter now! Thanks Liz! I can’t wait for the book either… Good luck with the Competition! 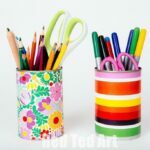 This is the cutest art supplies storage solution I’ve seen! LOVE!!! I am constantly amazed by your creative ideas. 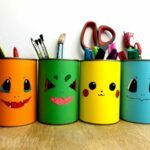 This craft/art supply station has to be one of my favorite posts I’ve seen thus far! I absolutely love that! How great. I’ve been wanting to use toilet paper rolls to make toothbrush caddies for the bathroom – you’ve inspired me to get that done! That is wonderful! I love how it is all contained in the shoebox lid. Awe, I was out for the day and I come back to all your lovely comments. Funny, as I am so used to seeing our desk tidy now, I didn’t feel it was so special anymore, so really nice to read your kind comments!!! Fantastic Maggy, I especially love the little boat! and your photo of Pip Squeak is adorable! 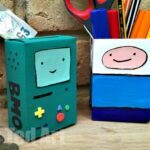 That is the cutest desk tidy ever. I was in Hobbycraft earlier and they were selling a plain desk tidy to decorate and i did wonder why people didn’t just make them out of toilet rolls. Awe thanks Rebecca! And I agree.. why buy a kit when there are LOO ROLLS! I need to start saving rolls! That is what I like to here!! Have fun making one. Perfect! 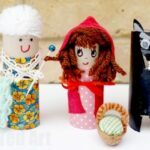 Toilet rolls really are great for crafting!!! oooh fab Maggy, and great photo of Pip Squeak! Oh Ness, sorry to be such a tease…. 😉 I do hope you will like the book!!!! Oh this is so fantastic. My son (and my husband) will love this! Definitely going on our to-do list. Thanks so much for posting. Can you say ultimately cute!!??? Where or how did you make the Knights? My son would love to play with those while he makes art for the fridge and family. Wow such a nice idea for tidy up her study table. Very nice use of the rolls. 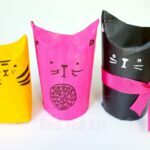 I have few plastic rolls from packing material i save for these diys …will use them. Thanks a lot. saved a lot of money of buying the organizers.